Description: Undoubtedly one of the best jazz pianists alive today, Kenny Barron recorded a pair of solo piano albums for the Japanese Eighty-Eight's label. 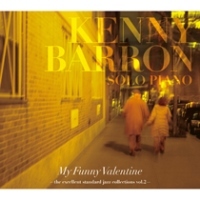 My Funny Valentine is the second of the two and contains nine standards plus an original by Barron ("Calypso"). After decades of playing at the top, Barron has nothing to prove here, and he is certainly not trying to break new ground or show off his amazing technique for its own sake. With most of the tunes played in medium to slow tempo and without gimmicks, what captivates the listener is Barron's respect for the melody, bebop-based improvisations and subtle harmonic shadings. The recorded sound of this CD is natural and excellent: Technologies utilized include DSD recording, blue laser diode cutting, green label coating, and silver spattering. Recommended! Recorded at Avatar Studio, New York on February 1, 2012.